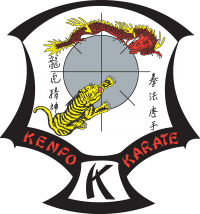 Roy Macdonald first started Kenpo in 1970 with Irish Instructor Don Cassidy, Don left to return to Dublin in 1974 handing the reins of Jersey Kenpo to Roy. There where many students left keen for the club to continue, these included John Jacklin, a Blue belt, Graham Lelliot, Dave Williams, Jim Rennie, all Purple belts, and many others besides. He then traveled to the USA to train under Mr. Parker and Larry Tatum. From 1975 he traveled for several years back and forth to Santa Monica and Pasadena USA, sleeping and staying in the Santa Monica Studio. Roy was awarded his Black Belt in 1979 in Santa Monica, he was accompanied by fellow Jersey Kenpo student Dave Williams, now a 5th Degree first generation Ed Parker Black Belt. In 1975 Roy contacted Rainer Schulte, an American working in Germany, who came over to Jersey to teach and grade many students until the early 80’s. 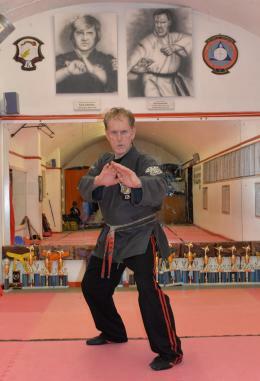 Rainer was one of Jersey Kenpo’s primary Instructors, coming over every 4 to 6 months. There were also many other Black Belts from the USA who came to teach at different times, Mr. Parker himself visited Jersey 19 times. Roy is invited to teach Seminars in dozens of European Countries as well as South Africa, Australia, Chile and the USA, he has also taught in many towns in the UK. His unique style of Kenpo is revered throughout the Kenpo World. A first Generation Student of Mr. Parker, he is now an 9th Degree Black Belt, Mr Parker said of him “Roy is one of the four most highly talented Black Belts in Europe”, the others being Rainer Schulte, Edward Downey and Gary Ellis. He has performed Kenpo in front of HRH Queen Elizabeth and the Duke of Edinburgh and was chosen as one of 8 Black belts to be a pall bearer to Mr. Parker’s coffin. The only UK and Jersey Black Belt on Mr. Parker’s Family Tree of Black Belts [Volume 1, Infinite Insights]. He has produced and helped 75 Black Belts since 1974, the very first ever Black Belts in Jersey were Graham Lelliot, Dave Williams and Jim Rennie. He was Mr. Parker’s IKKA representative for Jersey and Europe and has accumulated the greatest number of awards ever for a Jersey-UK-European Kenpo Black Belt winning 3 European Championships in Greece, Portugal and Spain. He has also competed in the Long Beach USA IKC and won the Masters Form division. He recently took part in the World Championship with fellow Black Belt Richard Matthews, winning the Creative Forms division. Having been active in the Kenpo arena for 36 years he still likes to compete and remains competitive in the Championships he chooses to enter. His club has produced 49 European Champions, 3 IKC Champions in the USA together with 11 world Champions since 1982. He is Chief Instructor of the Jersey Kenpo Association and runs the most fully equipped Kenpo School in Jersey and the UK with over 125 junior and 45 senior students active today. There are 12 senior Black Belts and 7 senior Brown Belts actively participating and helping to teach students young and not so young. He has been head coordinator for 5 European Championships and is now in charge of organizing the World Kenpo Championships in 2008 in Jersey.